CLASS IS CANCELLED, BUT KITS WITH INSTRUCTIONS ARE AVAILABLE. 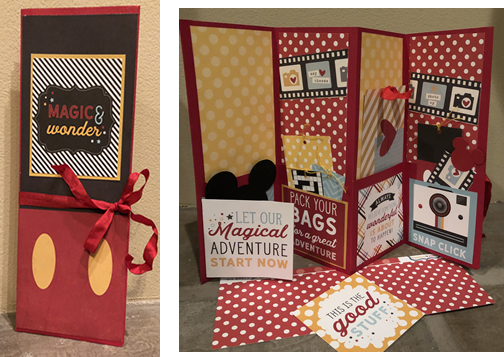 Turn a pocket folder into a happy Disney folio album! It’s perfect to collect your character autographs, photos & memories, or for a countdown to your Disney vacation! Bring Basic Class Kit, scoring blade or scoring board & bone folder, ¼” Scor-Tape, & glue stick recommended. Instructor Bio: Kellie loves to scrapbook "out of the album" for fun cute projects.